In the past, electronic devices in vehicles are connected via point to point wiring systems. Automotive manufacturers started using more and more electronics in vehicle, which resulted in bulky wire harnesses that were heavier and expensive too. Then they introduced a specialized internal communication network called vehicle bus that interconnects electronic devices inside a vehicle. Vehicle bus reduced the wiring cost, weight and complexity. Among the various bus protocols, CAN emerged as the standard in-vehicle network and it became the international standard known as ISO 11898. Bosch originally developed the Controlled Area Network (CAN) and it has been adopted by the automotive industry. Several higher level protocols have been standardized on CAN such as CANopen and DeviceNet which are commonly used for industrial communications. CAN is also adopted specifically for classes of vehicles such as J1939 for commercial vehicles and ISO11783 for agricultural vehicles. In this blog, we will describe in detail about the CAN protocol as an in-vehicle network. CAN bus is an inexpensive, robust vehicle bus standard designed for multiple CAN device communications with one another without a host computer. CAN is also called as multi-master serial bus and the CAN devices on bus are referred to as nodes. Two or more nodes are required on the CAN network to communicate. All nodes are connected to each other via a two wire bus (CAN H and CAN L) and the wires are 120ohms nominal twisted pairs. Termination resistor commonly 120 ohms is must in each node in order to suppress the reflections as well as return the bus to its recessive or idle state. Transceiver – It converts the data from the CAN controller to CAN bus levels and also converts the data from CAN bus levels to suitable level that the CAN controller uses. CAN controller – They are often an integral part of the microcontroller that handles framing, CRC etc. Microcontroller – It decides what the received messages mean and what messages it wants to transmit. The transceiver drives or detects the dominant and recessive bits by the voltage difference between the CAN H and CAN L lines. The nominal dominant differential voltage is between 1.5V to 3V and recessive differential voltage is always 0V. CAN transceiver actively drives to the logical 0 (dominant bits) voltage level and the logical 1 (recessive bits) are passively returned to 0V by the termination resistor. The idle state will always be in the recessive level (logical 1). Individually, CAN H will always be driven towards supply voltage (VCC) and the CAN L towards 0V when transmitting a dominant (0). 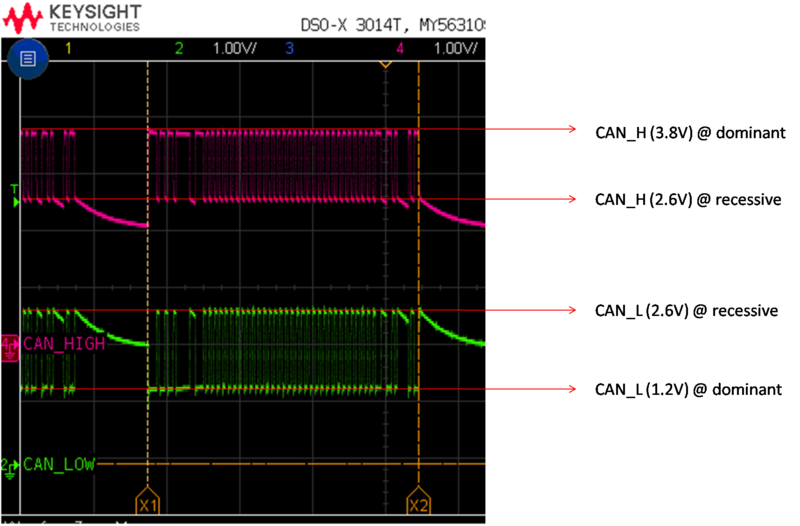 But in practical case, supply voltage (VCC) or 0V cannot be reached due to transceiver’s internal diode drop. CAN H/L will not be driven when transmitting a recessive (1) where the voltage will be maintained at VCC/2. The following figure depicts the block diagram and real time capture of the CAN signals. High speed CAN is implemented with two wires and allows communication at data rate up to 1Mbits/s. It is also named as ISO 11898-2. Antilock brake system, engine control modules, emission systems uses high speed CAN. CAN with Flexible Data rate is the next generation of high speed CAN communication with improved standards for higher data rates. CAN FD overcome the bandwidth limitation problems by allowing data rates higher than 1Mbits/s while also increasing the support of payloads up to 64 bytes in a single message. Low speed/fault tolerant CAN networks are also implemented with two wires and can communicate at a data rate of up to 125Kbits/s with fault tolerant capabilities. They are also named as ISO 11898-3 and found in devices where wires that have to pass through the doors of the vehicle which have light stress that is inherent to opening and closing a door. Single wire CAN interface have lower data rate up to 33.3Kbits/s and also named as SAE-J2411. The devices that do not require high performance like seat and mirror adjuster use Single wire CAN interface. Transceivers are available for each type of CAN physical layer and it is one of the important criteria while choosing the transceiver. Many semiconductor manufacturers provide CAN transceivers including NXP semiconductors, Texas instruments, STMicroelectronics, Maxim Integrated, Infineon Technologies and Linear Technology. Apart from generic CAN transceivers, there are special purpose transceivers such as galvanically isolated transceivers that are used for providing the isolated interface between a CAN protocol controller and the CAN bus. For galvanic isolated design, there is a need for isolated power supply and hence the design becomes more complex and costlier. Transceivers with option for direct interface with the microcontroller are also available which reduces the requirement of external buffer ICs for voltage compatibility. Following are some CAN bus terminologies that are useful to understand how CAN bus communication works. CRC – Cyclic Redundancy Check – The CRC field is used for error detection. It contains 15-bit cyclic redundancy check code and a recessive delimiter bit. Arbitration is the process in which two or more CAN controller agrees on who is to use the bus. It is of very important for the really available bandwidth for data transmission and this is the base for CAN bus communication. Arbitration process is performed over the arbitration ID. Bit stuffing is a practice used to guarantee enough edges in the NRZ (Non-Return to Zero) bit stream to maintain synchronization. After five identical and consecutive bit levels have been transmitted, the transmitter will automatically inject (stuff) a bit of the opposite polarity into the bit stream. Receivers of the message will automatically delete (destuff) such bits. If any node detects six consecutive bits of the same level, a stuff error will be flagged. If any node detects a dominant level (logical 0) while sending a recessive level itself, it will fail in the arbitration process and quits immediately will start acting as a receiver. This arbitration process is performed while sending the arbitration ID field of the CAN frame and at the end, only one transmitter is left on the bus i.e. the node with the highest priority (lowest arbitration ID) will pass the arbitration. Then the node which has won the arbitration will continue message transmission as if nothing had happened. Other receiving node can decide if a message is relevant or if it should be filtered using a combination of hardware and software filters. This process is continuous and other nodes will transmit their messages when the bus has become available. With this blog, we have covered all the basics of CAN communication including the physical layers, Data link as well as arbitration mechanisms. In the upcoming blog, we will explain more on software perspective about configuring a CAN controller for operation and handling message flow. Embien Technologies is a leading provider of product engineering services for the Automotive, Semi-conductor, Industrial, Consumer and Health Care segments. Embien has successfully executed many projects like Android based Auto infotainment system, GUI for TFT based instrument clusters, vehicle tracking devices, etc. Embien also offers a set of solutions such automotive grade BLE module (eStorm-B1), CAN to BLE gateway, CAN to RS232/RS485 gateway, LIN to BLE gateway, Sparklet GUI library that can be used to shorten automotive product development costs and time significantly. As a leading embedded technology company with deep domain knowledge, Embien Technologies offers comprehensive solutions and services enabling customers develop products better and faster. © Copyright 2018, All rights reserved. Embien Technologies India Pvt Ltd.